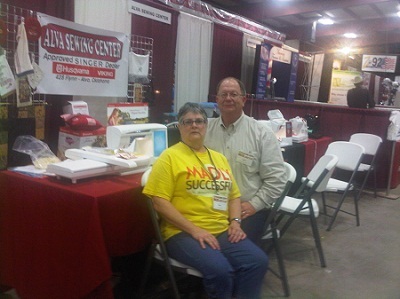 Alva Sewing Center has been serving Northwest Oklahoma and surrounding areas since 1985. We began as a Singer dealer and have since become one of the leading Premier dealers for Husqvarna Viking also. Originally we were located in a wonderful old brick building on the South side of the downtown square, which burned to the ground in 2004. This move took us to the North side of the downtown square. A dear friend recreated our store front on a brick from that location. Our store logo was inspired by that treasured gift. Today we’re in a new phase of our retail life. We have just relocated to the South side of the downtown square of Alva--415 Barnes. We are still located in with the quilt shop, Fabrics and More Etc at 413 Barnes. Same 2 great stores in 1. This has worked well for our customers who can purchase material and sewing machine supplies all at the same location. We carry all the hardware you need for your sewing projects including Husqvarna Viking – Singer machines, serger, sewing cabinets, patterns, bobbins, embroidery accessories and specialized feet. If you don’t find what you need, contact us and we’ll try to find it for you. We are updating our site with new products all the time, so check back often.